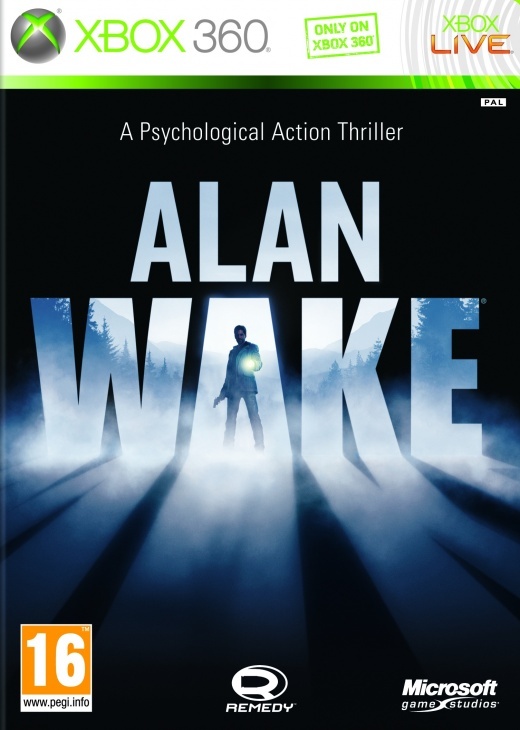 This walkthrough will tell you how to get through the Alan Wake game for the Xbox 360. First of all thanks for your interest in this little walkthrough. Its taken me some time to complete, so I hope you appriciate it and hopefully you can get a little help if you turn out to need it while you play Alan Wake. Secondly its important to point out that the walkthrough below has been written by playing on "easy", there are more Coffee Thermos and Manuscript Pages to be found if you play in Normal or Nightmare mode. By the way, sorry for this basic layout. The English version of our site is not completely done yet, so keep an eye out for www.Xboxlife.com. If you wanna see what we are all about, visit our 6 year old Xboxlife Denmark or Xboxlife Sweden. As a few general hints that goes for the entire game, its worth to mention that light equals good and dark equals evil. Use your flashlight to point at your enemies to make them vunerable to your weapons, and always make sure to collect all the ammo and batteries that you find during your way through the history. Running out of either ammo or batteries can easily mean a painfull death. Also notice that it is possible to aim without boosting your flashlight, just don't press "LT" too hard. After the short cutscene, you are in your old house talking to Alice. Start by switching on the coffee maker, its in the room to the left, just follow the radar. After that go to Alice, dont forget to pick up the Coffee Thermo located in the same room as Alice. Walk out of the room to check out the cover mockups that Alice mentions, they are in the last room down the hallway, again just follow the radar. When inside the room, pick up the Manuscript page, and then check out the mockups. The light goes out, and as we already know, Alice is affraid of the dark and asks you to go and have a look at the fusebox. When at the fusebox, pick up the flashlight and walk back to Alice. A cutscene starts. After the cutscene, we'r back to Bright falls in the present day. After listening a bit to the doctor, you can exermine the fish on the table if you wish, after you are done, go out of the room and head for Officer Sarah, on your way you can exermine the "missing" posters on the wall to your left. Just follow the radar to find Sarah. When you arrive at the room, pick up your cell phone as Sarah says. As soon as you pick up the phone, it will ring and Alice and a male voice will talk to you. Do as he says and follow the radar to the back lot, but before you walk out make sure to go to the room in the far back to pick up the Coffee Thermos. On your way to the back lot you will enter the police stations prisonblock, a prisoner asks you to turn the light on - go back to the door where you came in, and help out the poor guy by turning on the light. Now walk to the last cell, there's a Manuscript Page in there, make sure to pick it up. Now walk out of the door in the end of the hallway, right in front of you there's another Coffee Thermos, pick that up first - turn on the radio next to it aswell. Now follow the radar to the junker, at some point you will get the option to "focus", doing this will show you the car that the kidnapper was talking about on the phone. Kick your way through the fence, if you look to the right you will see another Manuscript Page. Go to the old junker and pick up Alice's driverslicense which is located on the front seat. After a short phonecall with your agent, its time to leave the Sheriff's station - just follow the radar and walk back through the station and approach Sheriff Sarah. Another series of story-related cutscenes starts. When you gain control again, you are at a diner. Go and talk to Rusty as the objective tells you, before you go outside, pay attention to the bar, there's a Coffee Thermos located at the handout . Do as Rusty tells you, and sign the form located at the desk, then take it back to Rusty outside. Pick up the keys that Rusty gives you and go back to the car - as soon as you open the mainentrancedoor another cutscene will start. Its time to go to the Lovers Peak, but before you head out, make sure to pick up the Coffee Thermos located in the cabbins kitchen. There is some batteries located in the kitchen as well, if you need them, make sure to pick them up - cant get enough battery power in this game. Go outside but before you follow the obvious trail, make sure to go around the house and into the garden, there's another Coffee Thermos located at the Spa. Now its time to follow the trail, when you reach the car and the little shelter, pick up the Manuscript Page located to the left of the shelter-entrance. Following the trail, you will soon see a house to your right, go inside of it, there's a radio inside. If you need more ammo for your gun, there's some located in the locked clothset. After you are done listening to the radio, go back outside and down to the small playground and cross the small bridge to the left. Walk down to the next house, this house is a bit out of shape so to say, so you have to kick the door in. Inside the cabbin you will find a television, turn it on. Also notice the blood on the floor. After watching the TV show, go to the clothset and open it. Head out of the house and back to the trail, at some point you can see a car a little further ahead, notice the hidden trail to the right and follow it up to pick up another Manuscript Page located at the viewpoint. Go back to the original trail and down to the car, there is another Manuscript Page located in the open trunk of the car. Follow the trail a bit further and another cutscene will start. Run down to help Rusty at the visitor center. First of all there's a Manuscript Page located in front of the Park Officer building to your right. After picking up the Manuscript page, walk to the clearly damaged visitor center entrance and go to Rusty to get the key - don't forget to pick up the revolver in front of Rusty. Now walk back to the Park Officer building - once inside you will see another Manuscript Page in front of the backdoor. Now go into the room to the right, pick up some ammo and batteries from the locker located near the other door - then walk into the kitchen. Time to run back to Rusty, and prepare to kill the enemies that you approach on your way. Go out through the big hole in the wall, once outside you need to kill the Park Ranger and a few other Takens. If you need ammo, there's a little shelter in the garden filled with ammo. Now its time to get back on the trail and follow the radar once more. If you lost any health, make sure to recover under the light at the bridge before continueing. After a short phone call, just continue down the path and make sure to go to the right, at the table you will find another Manuscript Page. Go back to the stairs, and make sure to pick up the batteries and ammo located in the red box at the top of the stairs and just stay on the path down to the phonebooth, where you will find some more batteries, prepare for some Takens to attack you. After killing them off, just follow the path / radar down towards Lovers Peak. On your way you will encounter more enemies, just take them out - if you are in need of batteries or ammo run towards the red first aid box that contains a portion of both. After killing all the enemies, make sure to pick up the Manuscript Page located near the first aid box. Also if you go towards the phonebooth and beyound it, you will see a flashing Coffee Thermos. Follow the path and soon you will be attacked by a lot of axe carrying enemies, just try to avoid getting hit and run, forrest run, through the gateway to the right and down to the light where you are safe. Next jump over the fence and pick up the Manuscript Page laying right in front of you. Press the button to call the lift and get into it, click the button again to activate it and wait for the cutscene. Follow the kidnapper, but make sure to pick up the ammo and batteries to the left of where you gain control of Alan. Help the kidn apper by throwing flares so he can kill the Taken, make sure to take the extra flares from the first aid box to the left of the locked gate. Once the gate is open, run towards the light to get in a safe zone. Follow the kidnapper once again up to the last stand, pick up the flares and batteries from the first aid box and prepare to battle. Notice the Coffee Thermos located near the entrance of the viewpoint - you need to pick it up during the fight else you wont be able to get it at all. After the cutscene start by picking up the gun, ammo, flares and battery. Then follow the path into the forrest. On your way make sure to pick up another Manuscript Page located close to where you start off. After that just follow the path untill you find something that flashes the same way as the Manuscripts does, but be warned do not try to walk over it or pick it up, its a trap that takes away some of your energy. Basically from this point and forward, you need to be really carefull cause more or less everything that has a white glow is an animal-trap which will drain your energy. Just walk slow and take it easy and you will be allright. At some point you will see some more batteries and ammo, and close to those there's a Manuscript Page. If you turn around you will see some cans setup in a pyramid, remember to knock those over by shooting at them with your gun. Keep following the path by using the radar to see the direction, and kill the enemies that you meet. After crossing a fallen tree, rush over to activate the generator to get some light and a safe zone. After recharging your energy, look around and you will find a Manuscript Page near the entrance to the shelter. Go inside the shelter and pick up the Hunting Rifle then go back out and follow the path once again. You will be asked to take focus on an aircraft, after doing that go towards it and into the back then walk all the way through the aircraft to make it tip. Go back to the back part of the aircraft, and you will now be able to get onto the right wing. Follow the wing and the yellow arrows and you'll find a box with flares, pick those up and then go back to the original path you were following. Walk futher down and kill the enemies that will show up, then rush towards the generator to turn on the light and get a safe zone. Once you stand in the light, your energy will once more recharge, and to the left you will see some more Hunting rifle ammo glowing in the dark, make sure you pick that up. Now follow the path again, and head to the left at the end you will find a Coffee Thermo. Move on and you'll stand at a small broken bridge, cross it and climb up the ladder to the right. Once you are at the roof it will start to move, and you need to jump down to the little roof to the right, after that jump down to the groundlevel. Go inside the mill and pick up the revolver ammo in front of you if you need it. Make your way to the top by using the stairs, make sure to point your flashlight at all the dark oily spots thats on the floor on your way. At the 2nd level there's a small room to the right, go in there and just outside on a balcony there's another Manuscript Page. Continue up the stairs to the top and kick the weight to the left to make the elevator go up, then jump over the gab onto the platform - but hurry cause it wont stand still. When you are on the other side, pick up the Manuscript Page located right in front of you. In the next room you will find two flares, and if you go to the far right corner, there's another Coffee Thermo. After picking up the Coffee Thermo, head up the ladder then head outside and up the small stair onto the cliff. Kill off the enemies that shows up, and head into the building to your right, here you'll find another Hunting Rifle, just in case you missed the first option to grab one. While in the building jump onto the crates and you'll see a Manuscript Page hiding behind them. After picking it up, head outside again and go over the fence. Rush to the Medical Aid box and pick up the batteries and ammo - then kill off the enemies that you encounter. Go to the next medical aid and grab some more goodies, dont forget the flare at the bench to the left of the box. Now move on towards the next area and kill the nice fellow with the chainsaw - this can be done quickly by using a combination of flares and the hunting rifle, just dont let him get too close to you. After killing off the poor lad, follow the path and walk up the stairs. After a quick phonecall from your friend, move into the camping area and make sure to take the supplies located at the First Aid Box, and the Coffee Thermoto the right of it.Now cross the Camping area and go to the building to the left, there you will find a Manuscript Page. Now first go into the toilets to your right, there you will find some more ammonition for your Hunting rifle, next up go to the toilet to the left to get the key for the garage. There's a TV in there aswell, so sit back and watch the show. Walk out, but be carefull a Taken is going to assault you from the toilet that was locked earlier. Just kill him off and continue to the garage. Get into the car and start driving, drive into as many enemies as possible but make sure to avoid any other obstacles. At some point your way will be blocked and you need to get out, then walk through the barrier and grab the flare gun and ammo for it located at the truck straight ahead. Continue killing the enemies that shows up, just stay to the path. At some point you will get a phonecall from the kidnapper, and after that you should be at the cabin where your agent Barry is hiding from the attacking birds. Pick up the flaregun and ammo for it, and then head up the stairway.There's a few extra flares at the balcony and some more batteries in the backyard if you go around the house. Kill off all the birds by lighting them up with either flares or your flashlight. After getting rid of the birds, go into the house and you'll meet Barry. Another cutscene starts and you've finished off episode two. Start by following Randolph, I was'ent able to find anything of interest on the way down to the trailer, so just stick closely to Randolph. When you arrive at Rose's trailer, knock on the door. A cutscene starts. After the cutscene you find yourself still inside the trailer, watch the TV show and go to the kitchen, there you will find a Coffee Thermo located on the kitchen table. Then continue out of the trailer and you will see a Manuscript Page on the path ahead. Now follow the path down to the car, again just look at the radar. On your way there's a radio standing on a stair, you really cant miss it. Continue down the path, if you look to the left all the way down to a white and yellow house, you can see a Coffee Thermo standing on a table outside. When you reach Randolph at the gate, a cutscene will start. After the cutscene, just follow the radar to get away from the police. Suddenly the darkness is your friend, just make sure you dont stand still for too long or you will get shot by the police thats tracking you. On your way you should find a Manuscript Page. At the end of the path you will see a police car getting thrown around, after that just run for the stairs and into the light safe zone. Just continue down the path and at the end you will find a small house lighting up the place, go up the stairs and use the two binarculars to look around the area, then go inside and take the Coffee Thermo and turn on the radio. Head out of the house again and down the stairs. Go through the door in the fence, and head for the radio station, at the closed gate turn left and walk up, there's a Coffee Thermo located on the rock (you might have seen it while using the Binarculars from the house). Next up go to the generator and start it, this will produce the needed power for the search light which you need to destroy the gate. Go back to the search light, and discover that the generator stops, then go back to the generator and kick it, then turn it back on. Head back to the search light and point it at the gate, this will destroy the gate. Go through the gate and just follow the path ahead. You will soon be at another gate, turn right and pick up the flashlight, then go back to the gate and use the flashlight to destroy it. Continue down the path, you will see a police car and right next to it there's some flashbangs - make sure to pick them up. Continue down the path and you will meet some enemies, since you only got a flashlight and some flashbangs, use the flashbangs to kill off the enemies. At some point you will discover a safe zone light, go there and pick up some more flashbangs, also turn on the radio. There's also some batteries located in the First Aid box. Continue down the path and cross the bridge, kill off some more enemies with your flashbang and move on, when you reach some more heavily damaged police cars, go to the trunk of the first one to find some more flashbangs. Once at the safe zone near the radio station, you might wanna recharge your health, then follow the radar in the direction of Pat Maine. Outside the house you can see a car, in front of the car there's a Coffee Thermo. Now go inside and find Pat, a cutscene will start. After the cutscene we'r back in the forest running again. Just follow the path towards the train station, on your way you should see another Manuscript Page located at the fence and a bit further ahead you will find some flares. Rush towards the generator, and throw a flare before you attempt to start it - this should hold off some of the enemies for a long enough period for you to start it, then rush into the safe zone. Here you will find a gun, some ammo and batteries. Continue down the path and you will find a shelter, in front of it there's another generator that you need to start to get rid of the attackers. Again it might help you if you throw a flare to keep em off, kill them entirely with the flashbang located next to the light you just turned on. To the left of the shelter there's another small shelter, go there and shoot the can pyramid and pick up the batteries and ammo for the revolver. Go back to the other shelter and pick up the shotgun and the ammo for it, shortly after you will be attacked once more. Move out of the shelter by using the doorway to your right, then turn on the working light outside and kill the attackers. Again its time to move on down the path, to your right you will see a small shelter, inside there's a Coffee Thermo. Continue down the path, and you should see another Manuscript Page to your right. Shortly after you'll see a First Aid box, go there and grab the stuff you need and continue further down the path. After the phonecall from Alice, you will be near another Manuscript Page that should be more or less right in front of you. Walk towards the bridge and climb up the ladder, then try to cross the bridge. Avoid all the flying objects and use your flashlight to make your way towards the right side of the bridge. Point your flashlight at the moving objects to drive the darkness out of them and make them disarpear. Once out, rush straight forward and try to avoid the barrels falling down from above - if you continue straight forward you will see a Manuscript page, near a ladder. Grab it and climb up the ladder, afterwards go and swap to the heavy duty flashlight, and also pick up the revolver and more batteries thats located right next to it. Move on into the court yard, to your right you will see a Coffee Thermo, pick that up and head straight for the house. There's an emergency box on the house that contains some more supplies. Move to the right and you will find a flare. Now click the green flashing button to activate the gate, some enemies will attack, finish them off and move out through the gate. When you enter the storage building to the right, you will be attacked by a few enemies, finish them off and move on to the far end of the room and go up the stairs. In the next room there's a few items to pick up, batteries, ammo, flares and a television show to watch. Exit the room and to your left you will find a Manuscript Page. At this point you will get attacked by a few enemies and a giant bulldozer. Kill off the enemies how you like, and use your flashlight to throw light at the bulldozer to make it go away. After you have finished off the bulldozer, have a look around the court yard, there are three emergency boxes located there with some goodies for you. When you are ready, press the green flashing button to open the gate - take the batteries thats located to the right of it too. Just after going through the gate, go right, there's a Coffee Thermo. There is nothing else around here, so just head for the car and drive out. A cutscene starts. Once the cutscene is done, get back into the car and start driving towards the coal mine. Further down the road you will see another car, but there's no reason to swap it or investigate. Just follow the path untill you reach a stairway, then get out of the car and use the stairs to get to the next level. In the small shelter located at the top of the stairway, you will find a radio. Go back out and take the car and head for the coal mine. Following the way you will soon be at another stairway that leads up to a guard viewpoint, there's another radio up there, nothing else. Go back to the car and once again follow the road, next stop is a big red building - go inside of it and follow the stair all the way to the top - here you will find a Manuscript page. Go back to your car and follow the road and shortly you'll be at the coal mine museum. Move a little forward and you will see some ammonition, and soon you will be attacked by some enemies. After you've killed them all, the darkness will throw some other items at you, just point your flashlight at them to make them dissarpear. Go straight ahead and into the trainwagon, here you will find some flashbangs. Move on and just follow the path and kill the enemies that shows up. At the end of the path there's a trainwagon making some strange sounds, climb to the top of it and open the hatch, then use your flashlight to kill the darkness thats inside the wagon - afterwards, jump down the hatch and you will find yourself inside a building. There's nothing inside, so just head for the door to the right and go outside. You need to cross over to the other side of the stairway, but first you need to turn off the electricity. Get into the car and drive to the far end of the trainstation, you will encounter a number of enemies, just run them over untill they are all gone - this is by far the easiest way and you wont waste ammonition and battery on killing them. Exit the car and go towards the green flashing button, pick up the flare gun and then press the green button to turn off the electricity. Once you get back into the car, the darkness will start to throw things at you, so get out of the car again and use your flashlight to remove the diffrent obstacles thats flying towards you. When done, get into the car and drive back to the stairway, again try to kill as many enemies as possible by driving them over. Kill the rest off and head up the stairs and get inside. At the far end of the room there's some ammonition. As soon as the door to your left gets blown open, kill off the enemies and enter the new room, there's some more goodies in here. Go outside and head for the next level of the building and go inside. Again you will get attacked by some enemies, kill them off and climb the ladder to the roof. Here you will find a Coffee Thermo, and a Manuscript Page. Open the door to the left and go back outside. Once you are outside, go to the little house to the right, there you will find some ammo, batteries and a switch to open up the gate. Head out of the gate and pick up the flashbangs, then continue to follow the radar to the right. There's some oily stuff on the road, remove it by pointing your flashlight at it, no need to boost the ray of light. Move on to the right and kill the enemies that you encounter, there are several waves of enemies but the flashbangs can be used to easily take care of them. A little further down the path, you will find a Manuscript Page located on a little stone. Continue and you will reach the entrance to a mine, walk in and find a hidden chest with flashbangs in it. Watch out, as you will be attacked shortly after entering the mine. After killing off the enemies, go back out and head for the bridge at the end of it you will find a Coffee Thermo. Go back and take the stairs down from the bridge, at the end you will find an Emergency box and a stockpile of ammonition and batteries. After picking up all the goodies, continue to the left and you will find a working light that you need to turn on, and you also get the option to switch your shotgun to a pumpgun. Head to the left and keep rushing towards the working-lights in order to turn them on. You will get attacked by enemies all along the road and the working-lights is a helpfull tool to weaken them. Head up to the little red house to your left, theres a Coffee Thermo and some ammo in there. Now keep going from one working-light to the next and keep turning them on. Again you will be attacked by several waves of enemies, kill them all off in the normal manner and continue up the hill to the safe zone light and a checkpoint. Just keep following the path, look at the radar and kill all the enemies that you may encounter. When you are at the graveyard, make sure to find the little shelter to turn on the light and get the batteries. Back to the path you need to cross the ghost town, just before you cross the bridge there's a Manuscript Page, located on the bridge itself. Outside there's really only one way to go, thats towards a ladder which you need to climb. Afterwards just follow the path to the left, and at some point you will find another hidden chest containing some valueable goodies. Go back and take the path to the right and cross the small bridge - some birds will start to attack, like last time at the cabin, your flashlight is the solution to the bird problem. After crossing some more bridges, enter what looks like an elevator and get thrown down to the lower level. Once in the mine, its easy just to follow the path, make sure to collect all the flares you might find on your way. At some point you will be in front of a Manuscript Page, you cant miss it. Right after finding the Manuscript Page, you will get attacked by a few enemies, once they are dead, continue down the path where the big enemy came from. To the left you will find a Coffee Thermo. At the end of the path you will be in a mine shaft that you need to get out of, in order to do this you need to use the elevator to level the hanging iron, so you can walk right over. After that just climb the ladder and re-adjust the hanging iron once again. It might take a few attempts, but its easy once you get it. Once you get outside, move up the stairs and pick up the flares located at the top of the stairs. Climb the ladder that should be right in front of you, and pick up the Manuscript Page located on the top of the viewpoint. Now go back to the stairs and head down and follow the path. You will get attacked by some birds, after finishing them off, follow the path down to the generator that generates power for the mountain cable car and turn it on. Head for the cable car, and pickup the flares and the flare gun in front of it, then get onto the lift and press the start button. Halfway to the other side, you will be attacked by birds, kill them off, but be carefull not to fall off the lift. Once you are on the other side, you will get attacked by a few enemies and shortly after you will find an Emergency box and a safe zone checkpoint. Right in front of the checkpoint is a small stairway, go upstairs and shoot the can pyramid. Go up the stairs to the left, right infront of you there's a little shelter with smoke coming out of the chimney, go inside and pick up the hunting rifle. At this point you will be attacked by a few enemies, so kill them all before moving onwards, and then just follow the path / radar untill you reach the safe point under the light. There's an Emergency box here too with ammo, flares and batteries. Shortly after the safe point, you will be at a large bridge, here you will be attacked from both sides. Kill them all off and continue to cross the bridge, once you crossed it, go to the left and pick up the Coffee Thermo located there, then continue down the path guided by the radar. A little to the left on the path, there's another Manuscript Page to be picked up. The end of the path leads to an old mansion, obviously its only possible to get in through the basement, so kick the door in and continue over to the right corner of the basement, there's a way to get up into the first floor of the house. There's a little ammo spread around on the first floor, pick it up if you need it. Extra batteries is located well hidden behind a turned table near the wall. Continue up the stairs to the second floor and walk straight ahead, the floor will collapse, and you will have to battle a big amount of enemies being back to the first floor. After killing them all, move back to the second floor and go outside through the hole in the wall in the left corner. Now go all the way around the building to the left, there you can gather anoter Coffee Thermo. After collecting the Thermo, follow the radar back to the right path. A little further ahead, you will find a stairway - here is another Manuscript Page, you cant miss it. Continue down the stairs, and listen closely to the male voice this is an important part of the story that you wont want to miss. And that basically concludes Episode 3. Start by following Doctor Hartman and listening to what he has to say about your mental situation. This is going to take a while, but pay attention to after you meet the woman who sings inside the house, turn right and there's a Coffee Thermo on the reception desk. When being told to go to your room, follow the radar to get there, but when you are back on the first floor go right instead of left, there you will find a Coffee Thermo. Now go back to your room and a cutscene will start. After the cutscene is over, you will get told to Investigate racket. Go outside your room and head for the stairs, pick up the Manuscript Page located just above the stairway. Go downstairs to the killed Nurse and grab the keys. Now you can unlock the door which leads to some more rooms. Go into the first room to the right, there's a tape located on the table - play the three tapes to get some more insight in the story. Look around in the room, there's a Manuscript Page located there aswell. Go out of the room, and exermine the picture just opposite to the door. Next up you have to go to the last door to the right in the hall and unlock it. You will find your agent Barry in the room, and also a Coffee Thermo. Unlock the door into Doctor Hartmans room, and a cutscene starts. With everything going berserk, you now need to escape the metal hospital. In the beginning your way will be blocked by two pieces of flying furniture. You need to go back up to first floor and turn the working-light on by activating the generator. Once this is done, you can move downstairs again and get through the hole. The rest is pretty easy and straight forward. To get past the final door which is locked, get the giant ball to roll towards you - and then you are out. Head for Barry, dont forget to read the inscription on the statue in the middle of the garden, there's also some batteries lying on a bench. You need to get through the gates in the garden, use the flashlight to remove them and watch out for flying objects behind you when doing so. When the gate is down, head for the small shelter just in front of you to pick up some flares and batteries, then continue through the small gate and into the maze. Inside the maze you will get attacked by various enemies, but there's also some ammonition, batteries and a couple Manuscript Pages hiding in there. When you find your way out of the maze, you will be attacked by a couple of bad guys and after that you will be attacked by both birds and the Doctor, who has been taken over by the darkness. Kill the Doctor and dont forget to grab the flashgun from the Emergency box in the pavilion and also the Coffee Thermo. Now proceed and you will be attacked once more, after that there's a safe zone light, and just opposite there's a shelter. Go into the shelter and pick up the shotgun, the bullets and dont forget the Manuscript Page.When going through the outside hallway, you will be attacked again, use your flashlight and the shutgun that you just found to wipe them out. After going through the hallway, go right to find a flare, then continue left - a couple of items will start to attack you, use your flashlight to make them go away. Next up there's a Manuscript Page just before you go down a small stairway. Empty the Emergency box at the safe zone and continue straight ahead - some more attacks, and another safe zone ahead. Grab the flares, the shotgun and the Coffee Thermo near the safe zone, and continue to the left where there's a Manuscript Page at the end of the blocked off path. Now go back down the path to Barry, who accidently managed to shut the door so it locked. While he fumbles for the key you need to keep killing the enemies that approaches you from behind. Use the flares and the gun, I found the shotgun too slow to use in this situation. When Barry unlocks the door, hurry out and a cutscene begins. After the caraccident, you need to go left in order to try and find Barry there will be a little talk between you and Barry, and you now have to go to the Andersons farm. In the beginning just follow the rails to the left, when the rails end up inside a tunnel, you should see a Manuscript Page, now head back out of the tunnel and straight forward - at the end you will see a Coffee Thermo, but be carefull cause the darkness is throwing everything at you, and you got no flashlight or flares to defend yourself - or atleast I didnt at this point. Go down the stairs after taking the Coffee Thermo, and follow the radar to the small gate where you need to turn the light in order to remove it. Turn the light, then walk up the stairway just to the right of it, here you will find a Manuscript Page, just next to it there's the generator that can turn on the light and remove the gate for you. Go back down to the gate and go into the shelter to the left and grab the flashlight. Go down the stairs and rush to the green flashing button that you should be able to see close by. Turn it on quickly as you have enemies running after you. After collecting the batteries on the ground, rush towards the next safe zone - once again you will have to hurry and do anything you can to avoid the enemies who's trying to catch you. After this safe zone, you have to continue down the path, and you will find a camp with tents, pickup all the supplies you can find there, including the Coffee Thermo and continue. At some point you will see a bright light, and another Manuscript Page will come falling down from the sky, Alan talks a bit. Dont forget to pick up the page, nearby there are some flares laying on the ground, make sure to pick those up as well. The next part of the level contains some of the traps that we've seen earlier, move slowly forward and avoid stepping on any of them. At the end of the path you will see a green lighting button on a generator, go and start it up and a safe zone will appear just above you. Close by the safe zone there's a Manuscript Page laying on the ground. Enter the room just behind the safe zone and pick up the ammonition for the shotgun you just found outside. Once again just follow the radar, but this time you might want to consider not fighting with the attackers, but just use flares to keep them away from you - then rush to the next checkpoint. There are simply too many attackers to survive, also pay attention to the animal-traps on the ground, if you get caught you are in alot of truble. You should now be standing in front of a house, and the car that you've seen a couple of times, is right next to the house too. Go inside and to the left, in the kitchen, there's some bullets for your shotgun, and also a Coffee Thermo. Now go to the right side of the cabin and collect the goodies that you find in there - don't mine the screaming guy, for all we know he probably deserves it. After collecting everything at the groundlevel, its time to head upstairs and kick the door in - then collect the gun and ammo thats inside that room. Listen to the dying guy, since its story related, and then go back to the stair and into the room straight ahead. Here you will find a TV show playing and nothing else. Go downstairs again and get prepared to get attacked by a huge guy in the room to the right. After killing him, jump out of the window and then go to the right, here you'll find an entrance to the cellar, head down there and find the hidden crate containing a flare and a flashbang. Go back outside and to the front of the house, you'll find another Manuscript Page located on the floor near the BBQ. Now go back to the car and start driving. After a short period behind the wheel, you will see a Coffee Thermo standing in front of an old tractor to the right. Go back to the car and continue driving untill you come to a crossroad. Continue driving straight to go to the house on your left. Go inside and find the hidden chest - also pick up the ammo, then go back out. No reason to go upstairs, theres nothing there - and no enemies inside the house either. Go back to your car and drive towards the viewpoint.Once you are at the viewpoint, go upstairs and you will find a hunting rifle and some ammo, there's a radio to be turned on aswell. Go back to the car, and kill the attackers thats waiting for you there, after the fight, drive the car down the road and kill the Takens thats walking around there, when the road stops, get out and continue towards the farm on foot. Watch out for the big bulldozer that starts to move. Remove it with your flashlight. Some attackers will also show up from both sides, kill them off aswell. Then continue up to the safe zone light straight ahead, and further on towards the farm. In the middle of the field there's a Coffee Thermo, after you grab it a rock concert will start, and you have to defend the stage. Near your Agent Barry on the stage, there's another Coffee Thermo. After successfully defending the stage against all the attackers (use a combination of flares, flashbangs, guns, etc. - and dont forget to recharge your health when you get the chance), go to the right side of the stage and take the Manuscript Page that lights up, then follow Barry to the farm. After arriving at the barn, you need to walk to the cornfield to the right of the barn, in the right corner of the field, there's a tractor and a wagon. On that wagon you will find a Manuscript Page. Go back to the barn and climb up the ladder on the right side of it and walk around to press the green button - this will raise the tank that was blocking the barns entrance. Go to the entrance and open the door, walk in and you will find some ammonition and batteries. There's also a TV that you can turn on, and of course a Coffee Thermo in a dark corner. Head up the stairs and to the right you'll find a Manuscript Page, walk a bit further on the first floor and press the green button to open the main gates of the barn. Shoot the attackers and go down to the groundlevel again. Go outside and killoff all the attackers, then head for Barry at the next safe point. Follow Barry through the door, and kick in the door located to the right, then head upstairs. There's some shotgun ammo at the first floor if you need it, else continue up the stairs to the second floor, where you will be attacked - after killing off the enemy, grab the Coffee Thermo located just in front of you. Now continue op the stairs to the third floor and climb up the ladder. On the fourth floor, there's a new flashlight and also the last radio of the game. Finally walk up the stairs to the fifth floor, and start the generator then head outside and click the green button on the lift to go down again. Once you are down, kick the elevatordoor open, and empty the Emergency box located to the left then leave the house and prepare to get attacked by a huge harvester and some of the darkess friends. After you finish them off, go through the door where the last enemy came from and climb up the ladder to reach the roof, then jump off the roof in the direction of the barn. Enter the small shelter where the light is flickering, to get the keys to the silo door - then head to the silo which is to the left and unlock the door to get Barry out. Follow Barry to the Anderson house, "Valhalla", and help him open the gates on the way. Enter the Andersons house and enter the door just to the right of the main entrance, there you will find a Coffee Thermo, now go to the kitchen where you will find another Coffee Thermo, then try to locate the Fuse box on the first floor (the most far away room to the right). On the first floor you will find a Manuscript Page aswell. After fixing the fusebox, go downstairs again and into the livingroom, choose to "play the record" and a cutscene starts. After the cutscene you find yourself in a dream, outside the cabin where it all began. First run towards the cabin, and go inside, watch what happend the night where Alice disarpered. This part of the game is pretty straight forward and will end by going into a cutscene that conclused Episode 4.